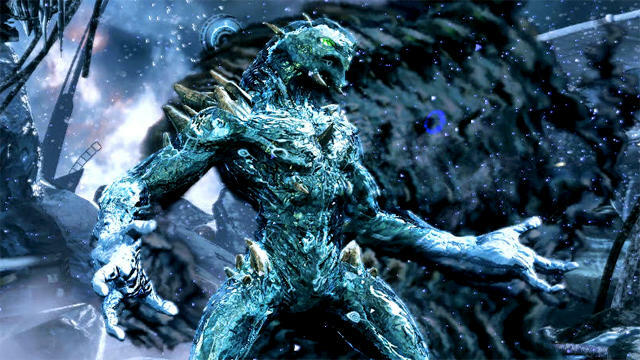 Killer Instinct made an appearance at the EVO 2013 fighting game championship this year, and developer Double Helix used its time to show off the popular character named Glacius. The trailer itself does a decent job selling the popular alien as he comes down to Earth and uses his icy punches and spikes to rip poor Sabrewolf to shreds. Just before the end of the trailer, the best surprise comes when a tomahawk flies into a pillar of ice, teasing the arrival of Chief Thunder, another character from the original game. Granted, Double Helix might have wished for a better reaction from the crowd, which erupted into boos at the very mention of the Xbox One and Microsoft. Killer Instinct lit up the stage when first announced at E3 this year, but it has since taken a lot of heat for its pay-to-play model. Only the character Jago will come with the free package, and Glacius, Sabrewolf, Fulgore, Spinal, Cinder, and now Chief Thunder must be purchased with extra funds as the player sees fit to buy. Double Helix justified its plan by saying most gamers only have time to get good at playing with one character anyway. The EVO 2013 crowd, a proud bunch of fighting game enthusiasts, most likely do not agree with that logic. Despite that, the game looks fun, and it will be nice to see these familiar characters brought back to life 20 years after their first inception. It's been a long time, and I'm getting rather sick of Street Fighter IV expansions and Capcom crossovers being the dominant force on the fighting game scene. Killer Instinct will be available at launch for the Xbox One as a free-to-play title. This gives the Xbox One an exclusive fighting game, something Sony does not have lined up yet for the PlayStation 4. Hopefully, they've come a long way since the days of Tao Feng and Kakuto Chojin. Despite that, it is not Sony that Microsoft has to fear in this realm. It's Nintendo. Killer Instinct or Super Smash Bros. as best exclusive fighting game?. Let us know below.